Figure 7-16. - A typical shell-and-tube condenser-liquid receiver. through the inner tube along with the exterior air condenses (fig 7-17) the refrigerant in the outer tube. This "double cooling" improves efficiency of the condenser. 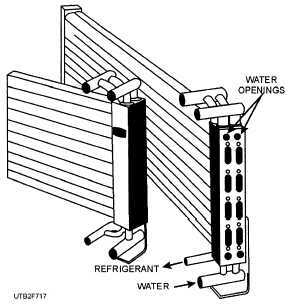 Water enters the condenser at the point where the refrigerant leaves the condenser. 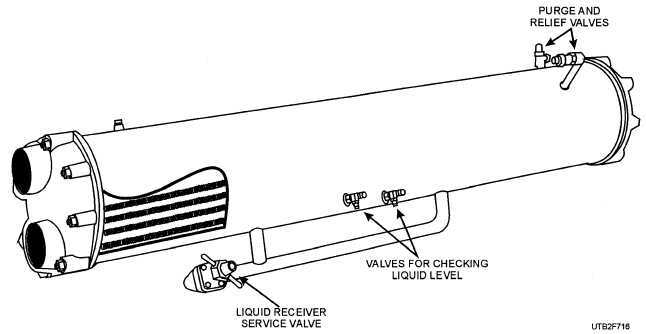 It leaves the condenser at the point where the hot vapor from the compressor enters the condenser. This arrangement is called counterflow design. Figure 7-17. - Tube-within-a-tube condenser designed to permit cleaning of water tubes. manifolds on the ends. When the manifolds are removed, the water pipes can be cleaned mechanically. You may be assigned to some activities where water-cooled condensers are used in the air-conditioning system. So, the Utilitiesman will probably have the job of cleaning the condensers. Information that assists you in cleaning water-cooled condensers is presented below. Water contains many impurities - the content of which varies in different localities. Lime and iron are especially injurious; they form a hard scale on the walls of water tubes that reduces the efficiency of the condenser. Condensers can be cleaned mechanically or chemically. Scale on tube walls of condensers with removable heads is removed by attaching a round steel brush to a rod and by working it in and out of the tubes. After the tubes have been cleaned with a brush, flush them by running water through them. Some scale deposits are harder to remove than others, and a steel brush may not do the job. Several types of tube cleaners for removing hard scale can usually be purchased from local sources. Be sure that the type selected does not injure water tubes.